A bacchante is a female follower of Bacchus, the goddess of spring in Roman mythology. Bacchante are known for their gaiety, mad songs, and frenzied dancing. Fredericks captured the spirit of these creatures in this sculpture through the stout, muscular body and its graceful lines. 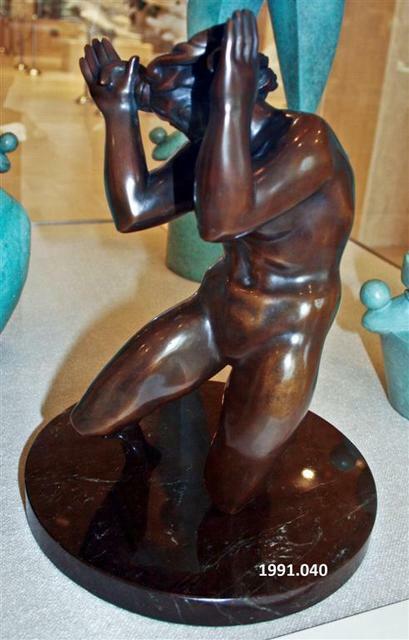 In 1938, Bacchante won first prize in sculpture in the Dance International exhibition in New York City. In 1972, Henry Booth commissioned Fredericks to make a life-size enlargement of the Bacchante for Cranbrook's Greek Theatre. Fredericks named the larger figure Persephone, the goddess of spring. A comparison of the Bacchante with the full-size plaster Persephone, or with the bronze Persephone in the Sculpture Garden, shows that the sculptor slenderized the later figure, but otherwise did not alter the youthful vitality and beauty of the Bacchante. Also on display is a small-scale Persephone which we call Bacchante. The label states it was created in 1935 and cast in 1989. The 1935 date corresponds to our records but we had this cast dated to 1991. I think the 1989 date is more accurate." Fredericks, Marshall M., 1908-1998, “Persephone, Bacchante [Bronze],” Marshall M. Fredericks Sculpture Museum, accessed April 24, 2019, http://omeka.svsu.edu/items/show/5089.